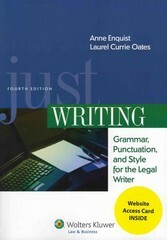 Just Writing, Grammar, Punctuation, and Style for the Legal Writer 4 Edition Companion Website: www.aspenlawschool.com/oates_enquist Adapted from the popular Legal Writing Handbook, this powerful guide focuses exclusively on the style, grammar, punctuation, and the mechanics of strong legal writing. With the authors' trademark step-by-step approach, Just Writing enables students to master a skill that will contribute to their success in both law school and practice. Proven to be effective in the classroom, the Third Edition features: honed coverage that zeroes in on style, grammar, punctuation, and the mechanics of legal writing in a concise length and format tips and techniques for every step of the writing process: planning, drafting, revising, editing, and proofreading the authors' trademark straightforward, building-block approach clear explanations and crafted examples practice exercises that allow students to use specific skills covered in the text writing for ESL students "Quick Tips" about writing integrated throughout the text a Glossary of Usage a bound-in CD with practice exercises a dedicated Teacher's Manual, with specific teaching suggestions for each chapter in the book additional teaching and testing materials on a Teaching Materials Website , available to adopters Enquist and Oates's clarity and finely honed content make Just Writing the perfect complement to any legal writing course. New professors will especially appreciate the ample teaching support that accompanies this book.